Got a small workshop? A table saw router table extention can free up some floor space for you as well as provide a wider surface area for working with larger panels. Ever since I moved my workshop to the basement of my house, I've had to rethink how I do things. The biggest problem is finding room for all my tools and giving myself enough room to maneuver around them. This open area between the fence rails is where I'll put the router table. The round bar between the rails is used to keep the rails from deflecting inward when the fence is clamped tight past the table area. My table saw takes up the most room, with the fence rails extending past the table on the right by a good 20". In a small shop like mine, this is wasted space that should be utilized. Putting a router table in this area seems natural as the two tools are used together on many jobs. 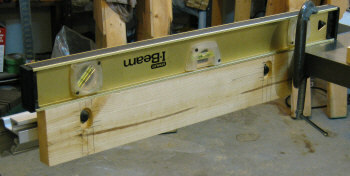 I can rip some stock to size, slide the fence over and rout a nice bead or chamfer at the same work station. I've used this set-up before and liked it. While the measurements and construction details you'll find here are specific to my table saw, the information should be useful for ideas on how you can fabricate a table saw router extension for your own saw. For the record, my table saw is a Craftex CT146 contractor saw from Busy Bee Tools in Canada. This model is the same saw as the Rigid 3660 minus the hercules lift and with a different paint job. They both come from the same manufacturer in Taiwan. I removed the brace from between the fence rails as it will no longer be needed. 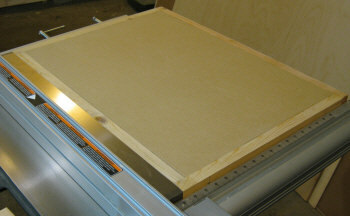 The router table top will serve as a more solid and effective brace. The distance between the two rails is dead on 27 inches. The distance from the cast iron wing to the end of the front rail is 20 inches and the rear rail is 4 1/2 inches shy of that at 15 1/2 inches. I'll use the full 20 inches of width and go to the end of the front rail. 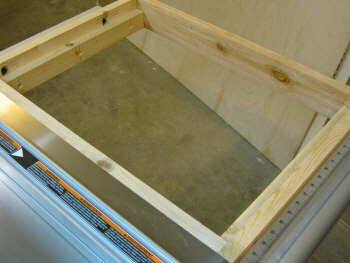 This t-slot will make a good attachment point for the frame of the router table extension. I want to construct this router table, saw extension as simply as possible. A perimeter frame with a step screwed to it for the table top to sit on should do the trick. The top can then be screwed down to the step with some countersunk screws. Simple and strong. I'm using some short pieces of 2 x 4 which I'll plane down to 1" thick. These are cut-offs from other jobs and I'd like to use them up. After I planed them to 1" thick, I ran them through on edge to clean them up and was left with a finished width of 3 1/4". The manufacturers of this saw have conveniently included t-slots on the inside of the fence rails which I'll use to secure the frame. 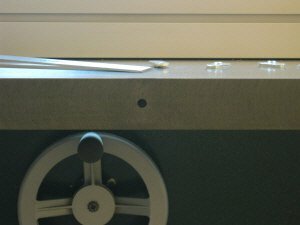 These t-slots are already used to mount the rip fence rails to the cast iron table. 1/4" hole in the side of the cast iron wing. I drilled a 1/4" hole at the midway point of the table saw's extension wing to anchor the frame. There's plenty of room on the backside for a nut and washer. This is the only hole I'll need to drill in the table saw. The ends of this part of the frame will be attached to the fence rail frame pieces with pocket screws. This way, it's all tied in together for strength. The fence rails will be framed in first and will be level with the saw's table. I'll cut these at 19" long. A 1" thick end board will will be used to make up the 20" total width of the router table frame. To mark the middle of the t-slot on the frame board, I clamped a straight edge on the table overhanging the fence rail and held the frame board up to it. From the top of the table to the middle of the t-slot was 1 1/16" on both fence rails. 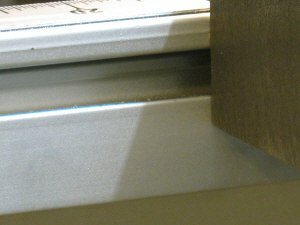 A closer look at the counterbored slot. I wanted some wiggle room to allow me to position the frame perfectly level with the table saw's top, so I routed a 1/4" slot 2 1/2" from each end of the fence rail frame board. This slot was then counterbored with a 3/4" router bit to allow the bolt and washer to sit beneath the surface. The center of the 1/4" slot corresponds to the 1 1/16" mark I made from the table top to the t-slot. 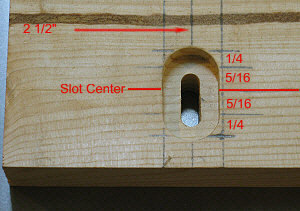 The ends of the slot are 5/16" from each side of this mark. The 3/4" counterbore extends 1/4" past the 1/4" slot to allow room for the bolt and washer to move. The front fence rail frame board bolted in place. Since the rear fence rail is 4 1/2" shorter than the front rail, the mounting location for the outer end of the rear frame board had to be positioned 1" from the end of the rear rail. Once the slots were cut, attaching the boards to the fence rails was simply a matter of placing a bolt with washer through the slot, threading the t-nuts on a couple of threads, slipping the t-nuts into the t-slot and sliding the board up against the straight edge and against the saw's table. 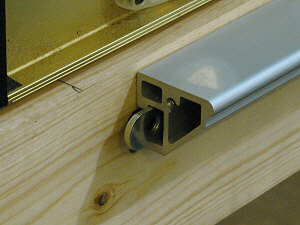 This photo shows the t-nut with frame board being slid into the t-slot in the rear fence rail. It's important to use the right length bolt. If the bolt is too long, it could push against the back side of the t-slot and cause damage to the fence rail. The bolts I used for this application are 1/4 x 20 x 1" long and were just right. After the two fence rail boards were in place, I trimmed a piece that fit snuggly between them on the left side where I had drilled the 1/4" hole in the table saw's wing. I clamped it to the wing with a couple of c-clamps and marked the hole location from the back side of the wing with a transfer punch before removing to drill and counterbore the hole. The completed outer frame. Inset shows close-up of pocket holes. I also drilled the pocket holes at this time and then re-installed it flush with the fence rail boards. Before driving in the pocket screws, a 1/4" bolt, flat washers and nut were secured in the center hole. 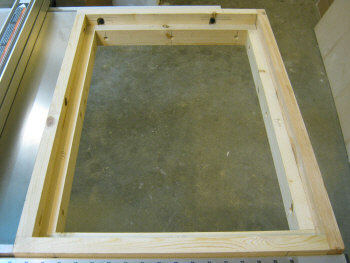 The right side frame board was simply cut to length and installed with four #12 wood screws 2 1/2" long. This completes the outer frame of the router table extension. Even though I'm working without a detailed plan of any kind, things still need to be done in an orderly sequence to avoid mistakes. Before I can make the inner frame that the top will sit on, I have to know how thick the top will be. The top is 3/4" mdf with 1/2" plywood laminated to the bottom using yellow wood glue. 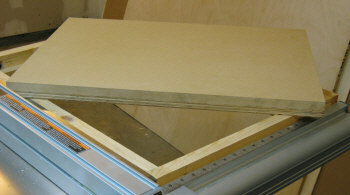 Many people use a double thickness of 3/4" mdf to construct the top of their router tables. That seems a bit excessive for such a small area. Although I could probably get away with a single layer of 3/4" mdf, I decided to glue an extra layer of 1/2" plywood to the bottom. This in in case I want to add a shop built router lift or anything else that would need to be secured to the bottom with screws. Plywood simply holds screws much better than mdf. I made the top slightly larger than the opening. After the glue had set, the top was trimmed to fit between the outer frame. The finished top measured 1.318" thick. The plywood was about .060" thicker than 1/2" and the mdf measures .006" more than the nominal size of 3/4". Front and rear inner frame boards that will form the ledge for the table top to sit on. The inner frame boards were ripped to 1 15/16" wide and the front and rear boards were then trimmed to 18" in length. They are the same thickness as the outer frame at 1". Three mounting holes were drilled and countersunk for 1 3/4" long #10 wood screws. The two outer holes are 2" in from each end, while the other hole is centered. All three holes are located 1" down from the top side of the board. The front and rear inner frame boards are c-clamped to the outer frame and the top is set in place to level it with the top of the outer frame. 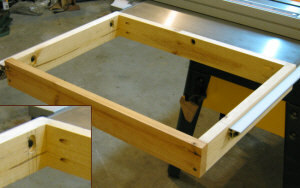 After clamping them to the inside of the frame, the top was inserted and leveled. You can just make out the c-clamps sticking out from the rear part of the frame in the photo on the right. The front clamps are not visible in this photo. After I made sure everything was perfectly level, and the top was all the way down on the boards, the screws were driven in. The inner frame will support the router table top. 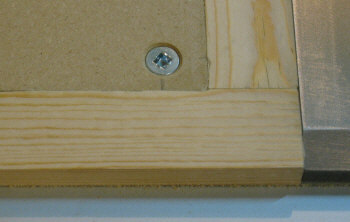 To avoid any chance of splitting the wood, I drilled pilot holes for the screws using the predrilled holes as a guide. I removed the clamps and the top and then trimmed the inner frame pieces for the sides to 25" and drilled and countersunk the holes. These two boards were then leveled out with the front and rear inner frame boards, clamped and screwed down with the same size screws as before. 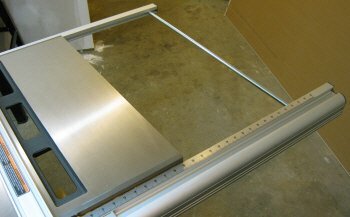 This 1" ledge gives the top plenty of support all the way around the frame and makes for a very solid working surface. None of the frame pieces were glued. If there ever is a need to remove the router table extension, I can simply take it apart. Many of the router table tops you'll find while surfing the internet have formica or some other laminate glued to the table's surface. While this does make for a slicker surface, it isn't absolutely necessery and can be quite an extra cost if you have to purchase an entire sheet. If you've got a piece already lying around though, go ahead and use it. The top mounting screws are countersunk. The top is secured with countersunk screws in the corners. I drilled the holes 1/2" from the edges and countersunk them so that the screw head is just below the table surface. I used 2 1/2" long #10 wood screws and drilled pilot holes before driving them in. No point in splitting the frame at this point in the game. This pretty much does it for the frame and top construction. In part 2, I'll fit the router table insert plate and mount the router. And in part 3, a router table fence will be added to complete this project. Router table part 2 - adding a router table insert plate. Router table part 3 - building the router table fence. 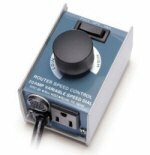 Router speed control for large bits. Are you using t track on your jigs and fixtures?